Taking inspiration from Shakespeare’s classic romance, Romeo and Juliet, West Side Story tells a tale of two lovers separated by their warring gangs — the Sharks and the Jets. Our two leads are Tony (Richard Beymer), a member of the Jets with a reputation for being loyal to his gang, and Maria (Natalie Wood), the sister of one Shark and the fiancé of another. Their singing voices are lent by Jimmy Bryant and Marni Nixon, respectively. Much like Romeo and Juliet, the characters find themselves falling in love at first sight. But of course, this is complicated by their contradicting affiliations. The conflict is well conveyed through the leads’ strong chemistry, as they add believability to a romance that could have come off as clichéd if played incorrectly. West Side Story modernizes different aspects of Shakespeare’s play. Instead of the Capulets and Montagues, we have the Sharks and the Jets. This conflict is made more relevant to modern times with the Sharks being a Puerto Rican gang and the Jets being a Caucasian one. The film finds strength in portraying both gangs as sympathetic and products of their surroundings (members on each side come from rough upbringings and experience racial friction). The dances that the gangs perform make them less threatening and while one may write this off as being unrealistic, the idea of gang members having the capacity to be upbeat and lighthearted adds humanity to the characters. No one is demonized here — rather, the opposite is true, for the gangsters are portrayed as victims. Considering the film’s 1961 release date, this is a surprisingly progressive stance to take on the subject matter. The plot bounces between the gang war and the forbidden romance. These two storylines converge toward the halfway point of the film and they contrast with each other in an interesting way. The gang war provides more exciting moments, such as the fight between the two gangs at the beginning of the film. This scene displays a lot of creative shots and flashy dance moves that are pleasing to take in. Meanwhile, the romance delivers more emotional substance. Even though the influence of Romeo and Juliet is apparent, the film sets itself apart, namely in its use of New York City as the setting. The streets of New York make a great stage for gang drama and the expression of trials inherent in growing up in such a place. 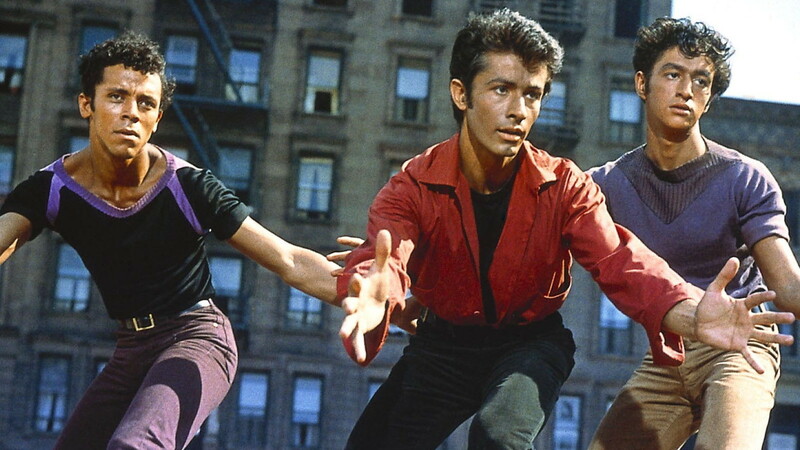 West Side Story’s cinematography is impressive, as the film finds inventive angles to view the city through. Visually striking and well-choreographed dance numbers employing astonishingly long takes are a major highlight. The presentation of these sequences gives the film some levity to contrast with the drama and colorful lighting choices help set the tone. They also make for a creative and entertaining expression of the various fights between the two gangs. The strong cinematography carries over to the more somber scenes as well, with the camera slowing down and closing in on Maria and Tony to display their isolation in this violent conflict. The film is peppered with songs of diverse tones, such as the solemn “One-Hand, One Heart” and the more energetic “America.” The songs illustrate the feelings of the characters, and are great fun to listen to, with a cast of competent singers that do a good job of projecting the energy and emotion of each song. One of the strongest musical numbers is the “Tonight Quintet,” which shows the differences between characters, while allowing for the plotlines to converge. This is accomplished by juxtaposing the gangs’ preparation for the ensuing street battle with Maria and Tony’s love ballad; all the while tensions slowly rise. West Side Story is a strong musical that is engaging and provides an interesting look at gang violence. The film beautifully balances the uplifting with the tragic through an excellent story that is presented with an elegance that few films can compare to. Tags: Kayla Hurowitz, Shakespeare week 2016. Bookmark the permalink.